‘Play It Loud’ book provides guidance for Metropolitan Museum of Art’s new rock-focused exhibition. 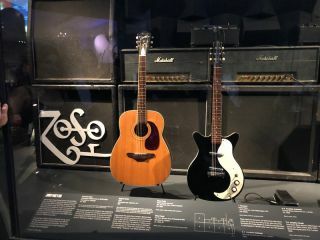 Jimmy Page’s guitars displayed in the new “Play It Loud: Instruments of Rock & Roll” exhibit. 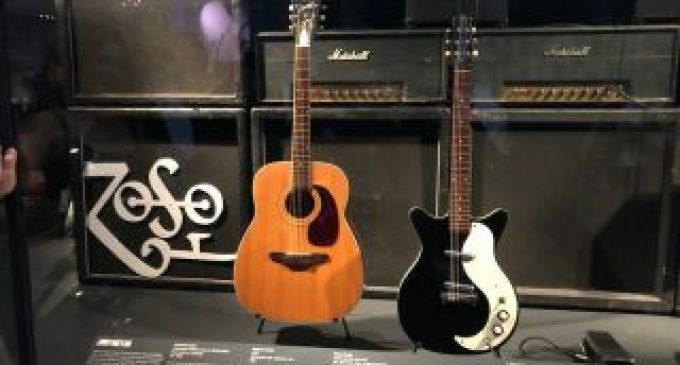 “Play It Loud: Instruments of Rock & Roll,” a new exhibition showcasing famous gear played by the likes of Hendrix, Dylan, the Beatles and more, is now open at the Metropolitan Museum of Art in New York City. A collaboration with the Rock and Roll Hall of Fame, the exhibit is partially inspired by Brad Tolinski and Alan di Perna’s 2016 book, Play It Loud: An Epic History of the Sound, Style and Revolution of the Electric Guitar. From Jimmy Page to Steve Miller, the glitterati of rock turned out for the exhibition’s opening bash on April 1. The Roots shook the house with a rousing live performance as the crowd wandered awestruck through a sequence of galleries filled with a holy grail of musical instruments graced by the hands and imaginations of legendary artists spanning the entire rock era — from Chuck Berry, to all four Beatles, to instruments played by contemporary music icons like Lady Gaga and St. Vincent. The exhibition covers the entire span of rock history; Ringo Starr’s Ludwig drum kit from the Ed Sullivan Show, Bob Dylan’s Newport Strat, Jimi Hendrix’s Woodstock Strat, Prince’s Superbowl 2007 symbol guitar and full stage rigs from icons including Jimmy Page and Eddie Van Halen. “When Alan and I wrote Play It Loud, the idea was to celebrate the profound cultural significance of the electric guitar. This wonderful exhibition is a triumphant validation of the importance of the instrument and how it has touched the lives of millions,” adds co-author Brad Tolinski. Find out more about the Play It Loud book at playitloudbook.com, and for more on the Met’s “Play It Loud” exhibition, head over to metmuseum.org.